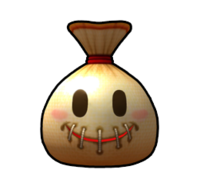 The Laughter Bag is an item in Mario Kart Arcade GP, Mario Kart Arcade GP 2, and Mario Kart Arcade GP DX. The Laughter Bag is a lock-on item. Upon hitting a racer, the Laughter Bag will slow the racer down slightly and then proceed to hover over the racer's head for approximately 7 seconds. If the racer is passed or hit by an item during this time, the Laughter Bag will taunt the racer by laughing at them. This page was last edited on February 23, 2019, at 00:34.